The Ching Ming Festival also known as Tomb-Sweeping Day in English falls during the third lunar month, this year it falls on the 5th April. On most days of the year, cemeteries in Hong Kong are mostly avoided but on the Ching Ming Festival, public transport companies in Hong Kong have to put on extra services to them, but why? Ching Ming literally translates as ‘clean and bright’, and this is the day that Chinese people sweep the graves of their ancestors. But the tidy up doesn’t end there. The festival is an important ancestor worship ritual that also requires families to tend to the graves, touch up headstone inscriptions, make offerings of food and light incense and. Traditionally, many people burn paper offerings at gravesites during the festival for their ancestors to use in the afterlife. The most popular of these are imitation paper money, but recently it appears that the consumer demands of the earthly realm have crossed over into the afterlife, as many people also burn paper mobile phones, laptops, luxury cars and designer handbags! Some people carry willow branches with them on Qing Ming or put willow branches on their gates and front doors of their homes. 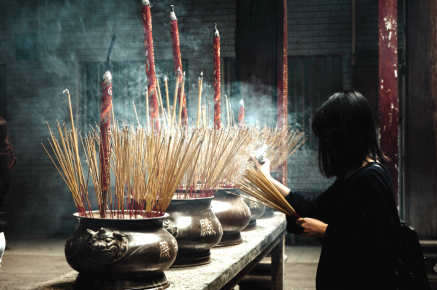 They believe that willow branches help ward off the evil spirit that wander on Qing Ming. Another popular thing to do is to fly kites in the shapes of animals or characters from Chinese opera. It is not only in Hong Kong that Ching Ming is recognized. Chinese people all around the world use this day to remember their family ancestors, whether at a local tomb or with a simple day of respect.